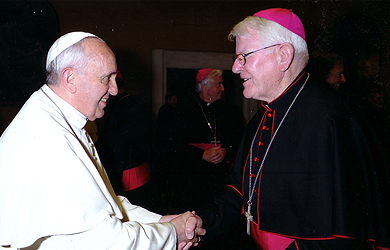 Bishop Michael Campbell OSA, was born in Larne, Northern Ireland, on 2nd October 1941. He comes from a family of six: three brothers and two sisters. After attending Campion House, Osterley, 1960-1962, he entered the Augustinian Order at Clare Priory in August 1962. On completion of his novitiate Bishop Campbell studied philosophy in Dublin for two years, and subsequently obtained BA in Semitic languages in University College, Dublin. He completed his studies for the priesthood at the Gregorian University, Rome, 1968-1972, having been ordained priest by Lancaster’s Auxiliary Bishop Pearson in the chapel of Austin Friars School, Carlisle on 16th September 1971. He served as teacher-chaplain at Christ the King School, Southport, and also as parish curate at St John Stone’s 1972-1975. From 1975-1985 he served in St Monica’s, Hoxton, London as Prior of the community and teacher-chaplain at Bishop Challoner Girls’ School in the East End of London. During this period he obtained his Master’s degree in Biblical Studies from King’s College. Bishop Campbell served in Jos, Northern Nigeria at St Augustine’s Major Seminary when he lectured in Scripture 1985 -1989. He then worked in the Diocese of Lancaster, teaching at Austin Friars School and also holding the role of Episcopal Vicar for Religious under the late Bishop Brewer, 1990- 1999. For eight years he served as Prior and Parish Priest of St Augustine’s Parish, Hammersmith in the Diocese of Westminster whilst also serving as Episcopal Vicar for Religious. 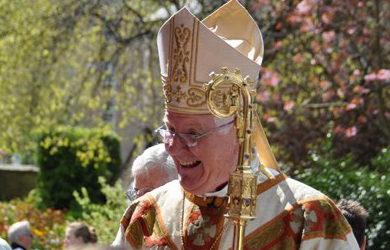 On Monday, 31 March 2008, Bishop Campbell was ordained Coadjutor Bishop of Lancaster at St Peter’s Cathedral Lancaster by Bishop Patrick O’Donoghue, Fifth Bishop of Lancaster. 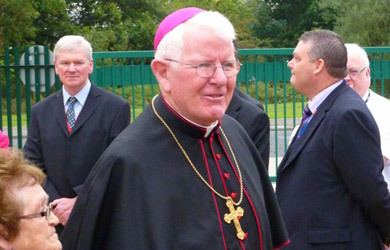 On 1 May 2009 Bishop Campbell took canonical possession of the Diocese succeeding Bishop O’Donoghue (who then retired) and became its Sixth Bishop.